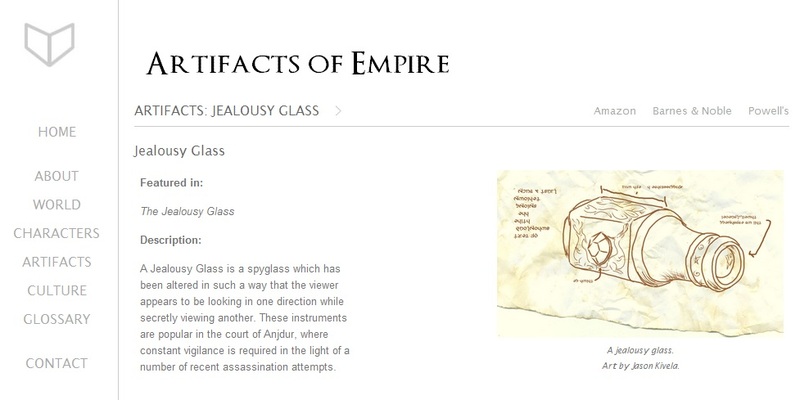 While I won’t start in earnest until after I finish edits on The Jealousy Glass, I’ve started scoping out a look and feel for the design of a website devoted to my fantasy series, Artifacts of Empire. I’ve always loved fantasy novels where the authors created compendiums and gave extra information about their worlds. What better way to say “thank you” to my readers than to create a website where they can see that information at no cost? I’m still developing what that website will contain (and, I suspect, this will evolve as long as I write Artifacts novels) but here’s a sneak peek at what I have so far. Disclaimer: The text is not final. The image on this page is courtesy of the amazing Jason Kivela, an artist that some might know for his work on The Guild of the Cowry Catchers.